Holiday Happenings at Brighter Living! We are coming up on the holidays, which means the temperature is dropping and sitting on your back porch in the evenings is no longer a viable option. Fortunately for us, heaters, movies and movie theater seating are readily available whenever we need them. So set the evening news aside and let us treat you to a picture perfect movie night! 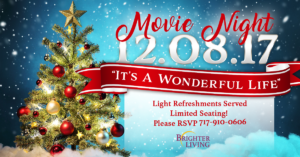 Brighter Living is sponsoring a movie night. We have two movie nights coming up in December. The first is on the 8th and we’ll be screening “It’s a Wonderful Life!” The second screening is on the 22nd and the movie this night will be “Miracle on 34th Street!” In addition, we will offer light refreshments provided to enhance your viewing pleasure. We have theatre seating and space is filling up quick, so make sure you call today to reserve your seat! Other events coming up include our annual Giving Tree event and Holiday Food Drive! In our Giving Tree event, we take donated clothing for children and ladies as well as children’s toys for all ages. All donated goods are given to the YWCA of Harrisburg which will go to support our local community! We would love for you to partner with us in Giving Tree! This event extends until December 18th. 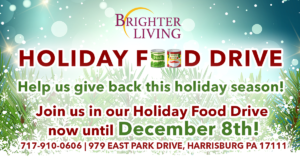 Our Holiday Food Drive extends until December 8th, so be sure to grab unopened cans from your pantry and swing them by Brighter Living! Those benefitting from our can drive will be those in the area. Join with us this holiday to help those in need! Brighter Living is an adult day care center who consistently creates a caring environment for every person who walks through our doors. We continue to look for new ways to engage seniors in daily activities that keep them involved and socially active. Learn more about us at www.abrighterliving.com . Next Post Next Post: What is Adult Day Care and How Can It Benefit My Loved Ones?